Microsoft Office 2007, or 2007 Microsoft Office System (O07) is the latest productivity suite from Microsoft official released and launched on 30 November 2007 to business customers, or early 2007 to mass public retail. Office 2007 is a major upgrade and has lots of improvements and innovative features over previous version of Office programs (Office 2003). One of the major new features of Office 2007 is the entirely new graphical user interface called the Ribbon, replacing the menus and toolbars that have been the cornerstone of Office since its inception. Another feature is the easy-to-remember (or more appropriately to call no-need-to-remember) keyboard shortcuts or shortcut keys to access to commands and functions of Office 2007 programs. The keyboard shortcuts mentioned in this article is unlike the Ctrl-S to save, Ctrl-O to open, Ctrl-Z to undo, Ctrl-Y to redo, or Alt-F4 to close type of shortcut keys popularly used in applications nowadays. 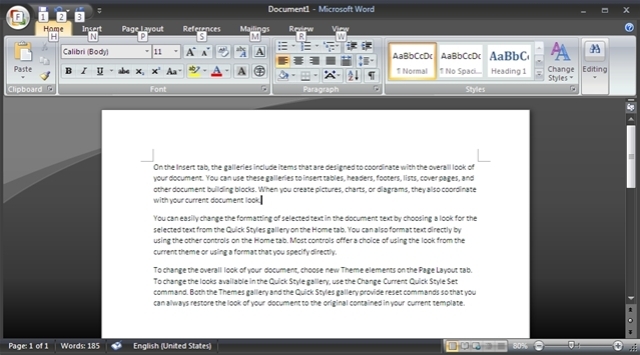 The keyboard shortcut keys in Office 2007 is a series of key sequence that allows users to access and trigger certain commands and functions without using the mouse. 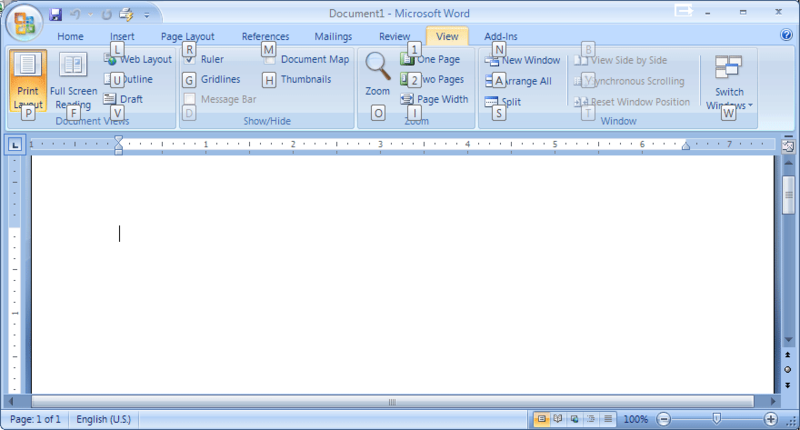 When compared with the old style shortcut keys, the Office 2007 shortcut keys have a whole new look and display. 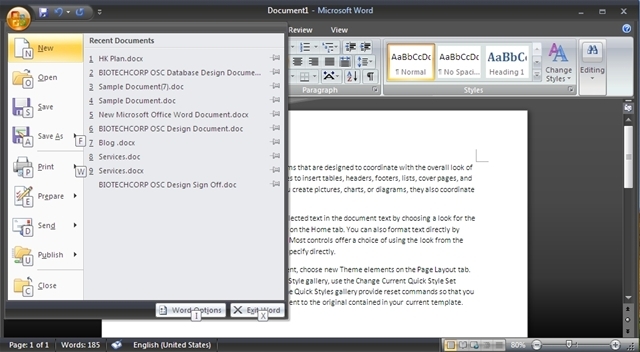 Word 2007 ribbon with keyboard shortcut keys displayed. The disabled shortcuts are still been displayed, although it’s grayed out. 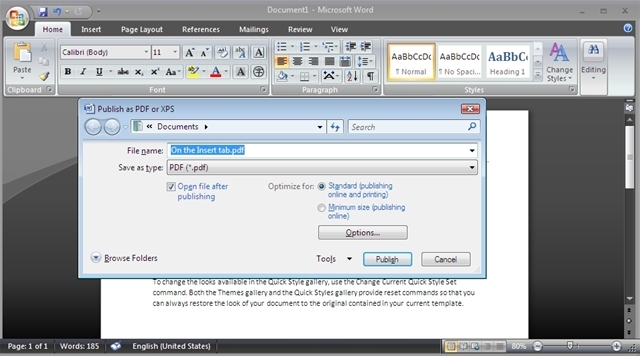 By using Save as PDF as an example, using keyboard shortcuts in Office 2007 is extremely easy and requires no memorization of key sequence or key combination at all. Simply press the Alt key, and the next available keyboard shortcuts for commands and menu options is been display. Press to F to access Office menu. Inside the Office menu, the available shortcuts for each menu items is displayed next to it. Simply press the corresponding key on the keyboard. In this case, press F again. Press on the appropriate keyboard shortcut again (P) to Save as PDF. After the complete keyboard shortcuts sequence, the Publish as PDF or XPS dialog window appears. So to access Save as PDF or XPS in Office 2007, the keyboard shortcuts is the simple Alt-F-F-P. And best of all, the keyboard shortcuts are available for almost all commands and functions in all programs of Office 2007 such as Word 2007, Excel 2007, PowerPoint 2007 and Outlook 2007. Update: The trick above works on newer Office versions with Ribbon menu, including Office 2013 and Office 2016.